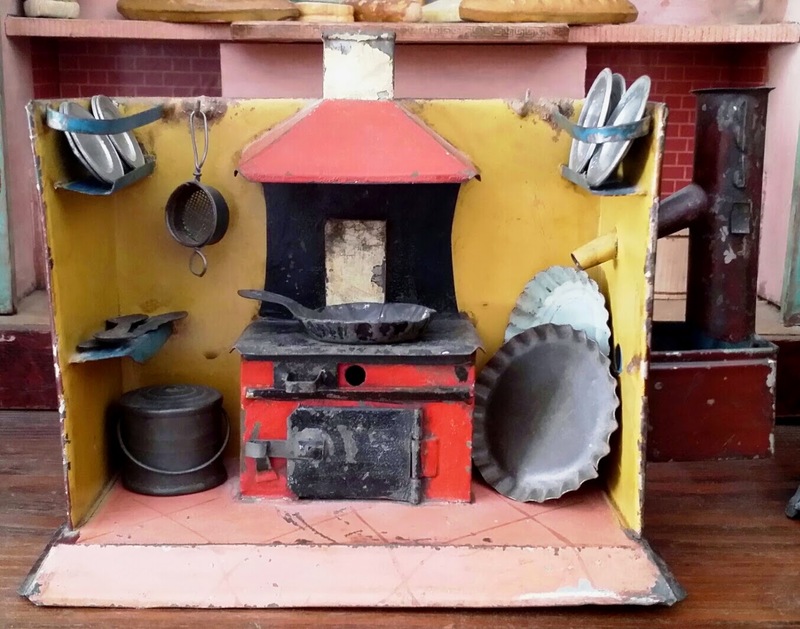 Tin toy kitchens, also known as doll kitchens, were made in Germany and America through the 1800s in a wide range of styles and price points. 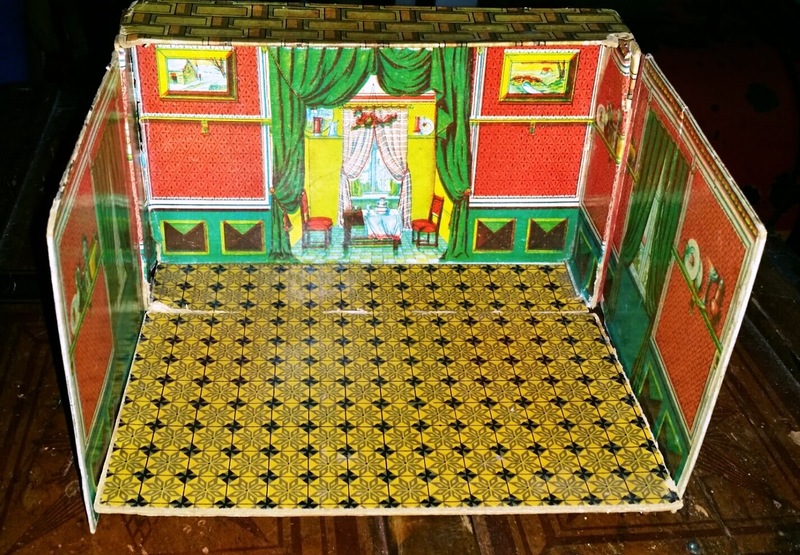 All were based on an open, three sided room box model. 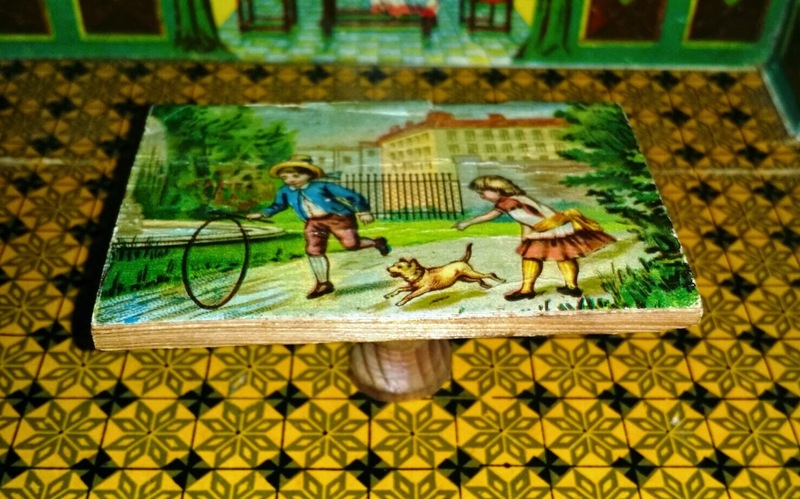 Large deluxe versions often featured working water tanks, functional sink taps, and a vast array of accessories, while tiny, simply made varieties offered only the merest suggestion of an oven, and relied heavily on children's imagination to make up for their lack of amenities. 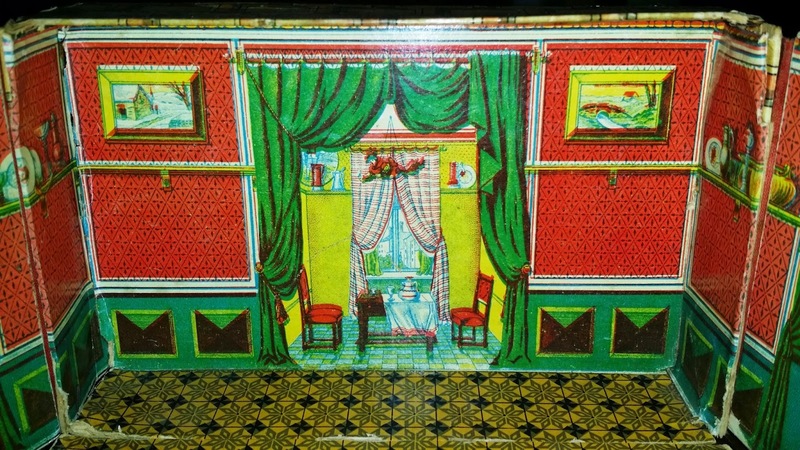 The kitchen still retains its unusually bright color scheme of yellow walls, salmon floor, and turquoise shelves. This second kitchen is the tiniest and crudest I've ever seen, and yet it has a primitive charm. 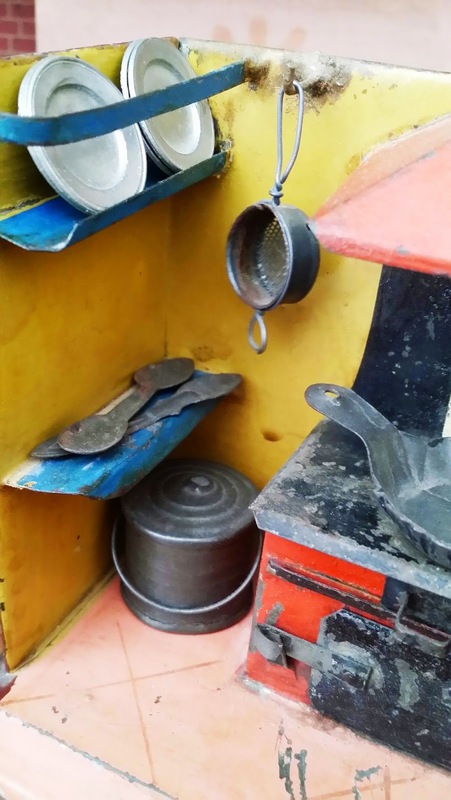 Measuring just 4 inches wide, it's almost pocket sized, and its stove is just a piece of folded tin, creating the merest suggestion of an oven. 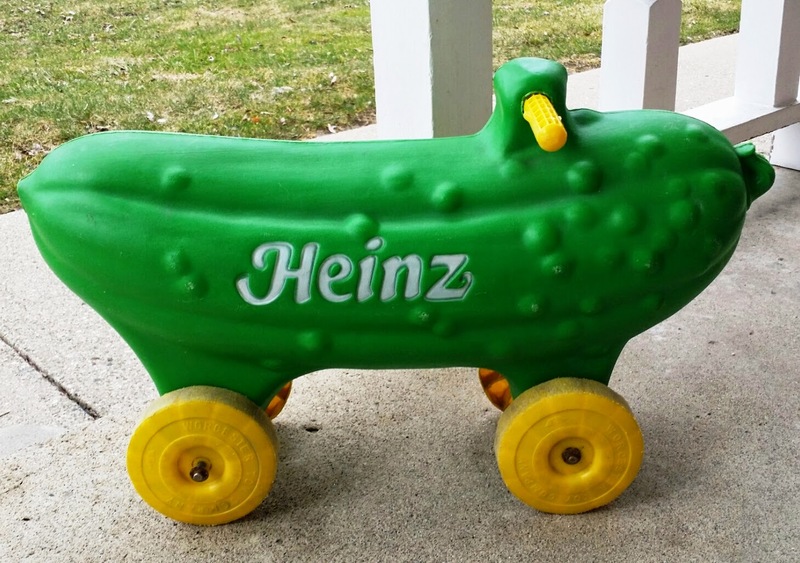 It retains traces of its original green paint on the side walls, and was clearly much loved and played with by its original owner. 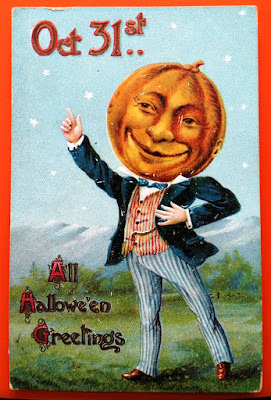 It dates from the late 1800s. To learn more about the history of these playsets and to see a larger, more deluxe model, click here. 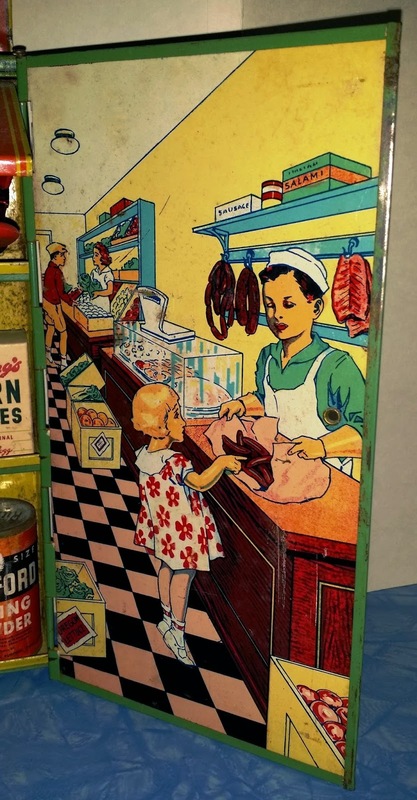 This tin grocery store playset was one of a variety of such miniature shops made by the Wolverine Supply and Mfg. Co. of Pittsburgh, Pennsylvania. 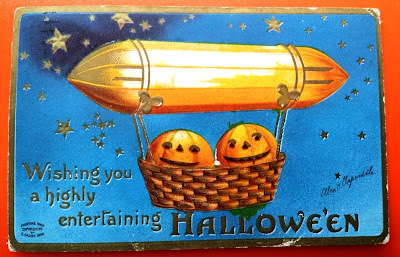 Founded in 1903, Wolverine began as a tool and die manufacturer before transitioning to toy making. 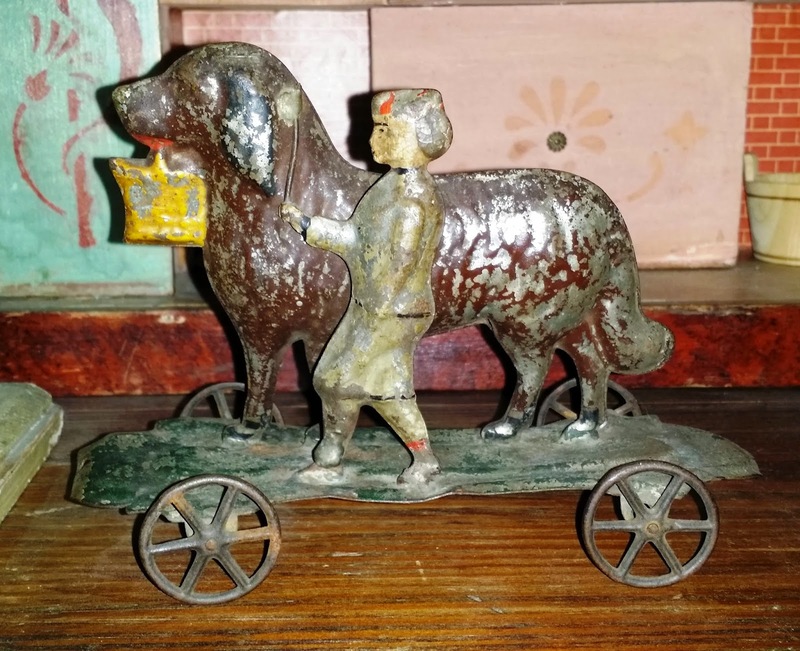 From the 1930s - 1970s, the company made a huge range of toy stoves, refrigerators, kitchen cupboards, tea sets, and many more domestic playthings, all crafted from lithographed metal. This store, known as the Corner Grocer, was made by Wolverine in the 1930s - 40s. The two wings of shelves fold in for storage. When extended, the entire shop measures 31 inches wide by 14 inches tall. 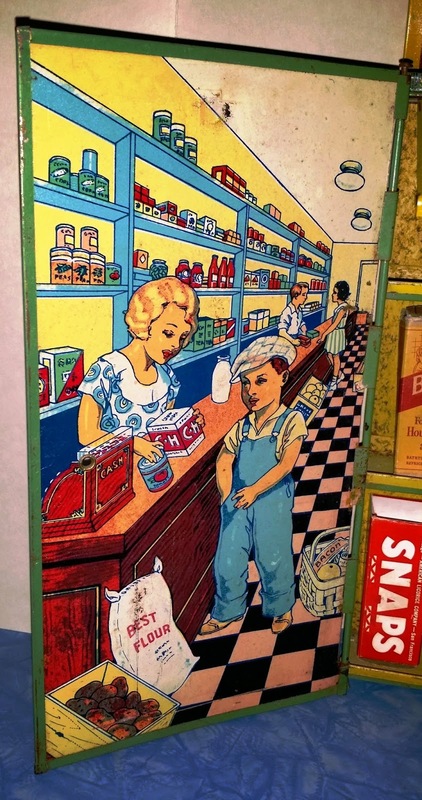 The highly detailed main panel features an historic grocery store interior. 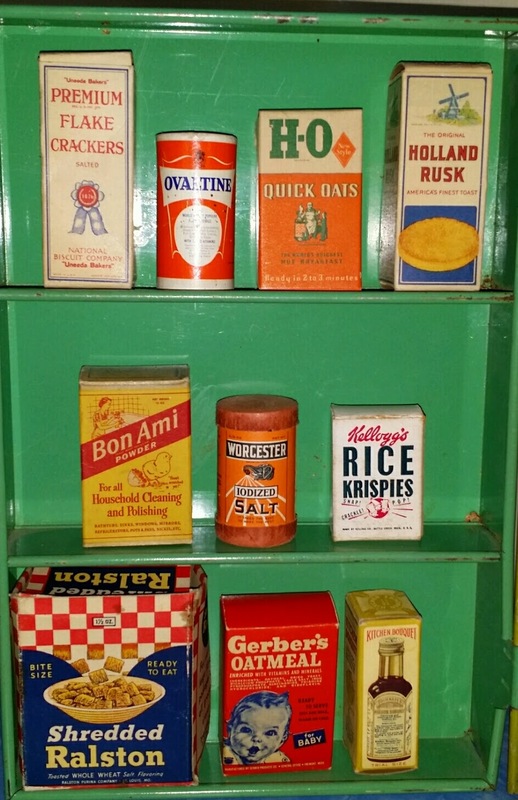 Visible in the lower left are glass fronted cracker or biscuit bins, and a variety of carefully arranged dry goods line the shelves. 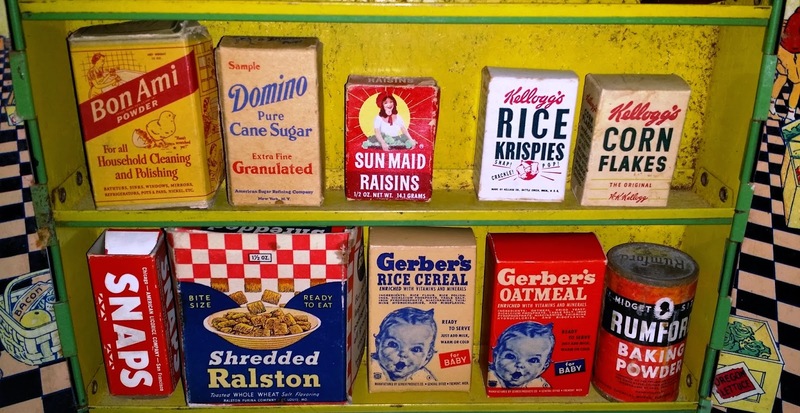 The store's actual shelves came filled with miniature packages, and the original child owner added a few additional pieces, including some salesman samples she probably got while shopping for real groceries with her mother. 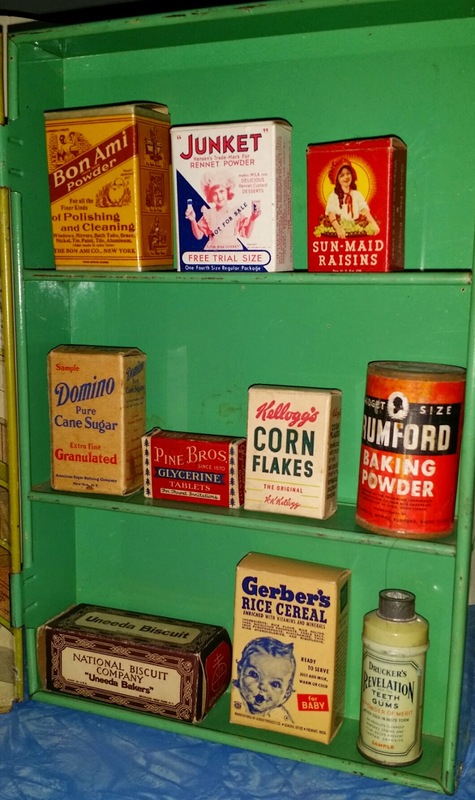 The free standing counters and accessory pieces that came with these stores are usually missing today, since they couldn't be stored inside the closed shop as the groceries themselves were. 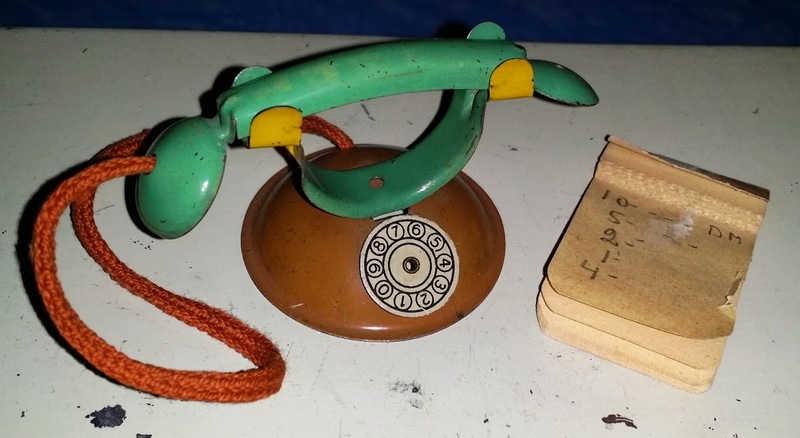 We were very lucky to find this one intact, along with its original shop phone. 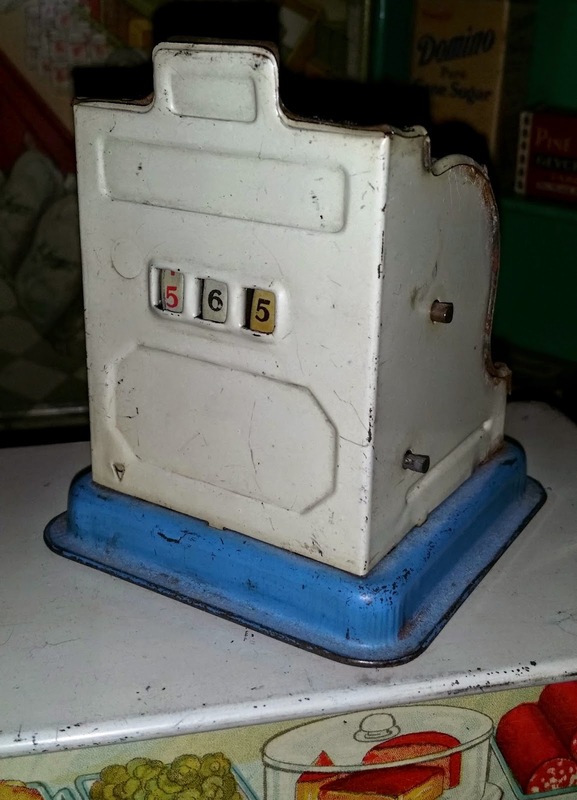 The scale and cash register were added, but fit the playset perfectly. 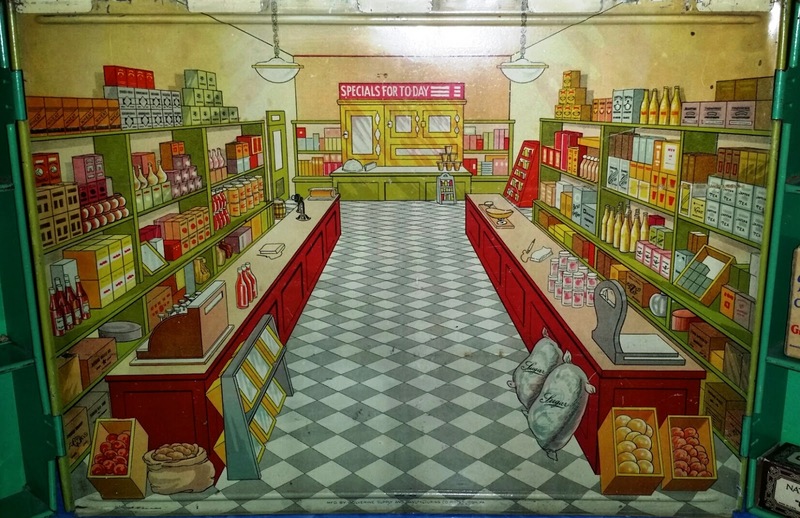 The front of the counter is illustrated to look like a deli case, complete with cold cuts and cheeses. 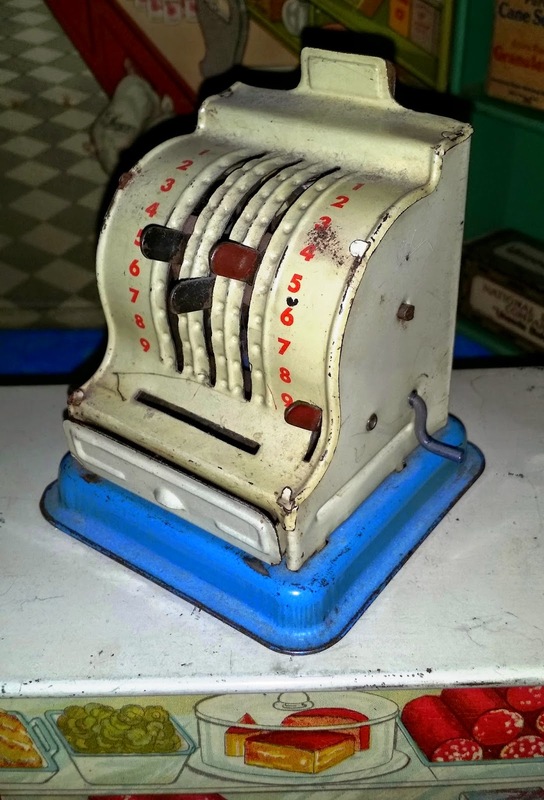 The miniature tin cash register actually works: as the levers are moved, numbers ring up on the other side, and the drawer springs open to take in tiny coins. 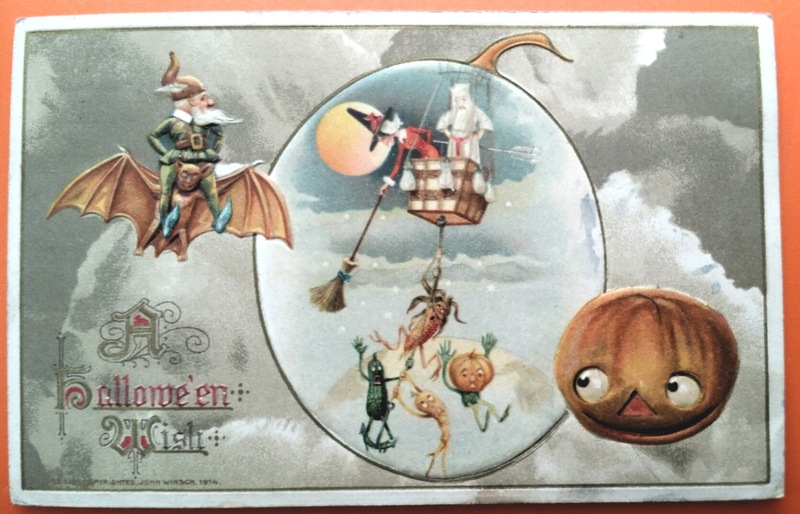 The Corner Grocer was one of this year's best Christmas gifts. 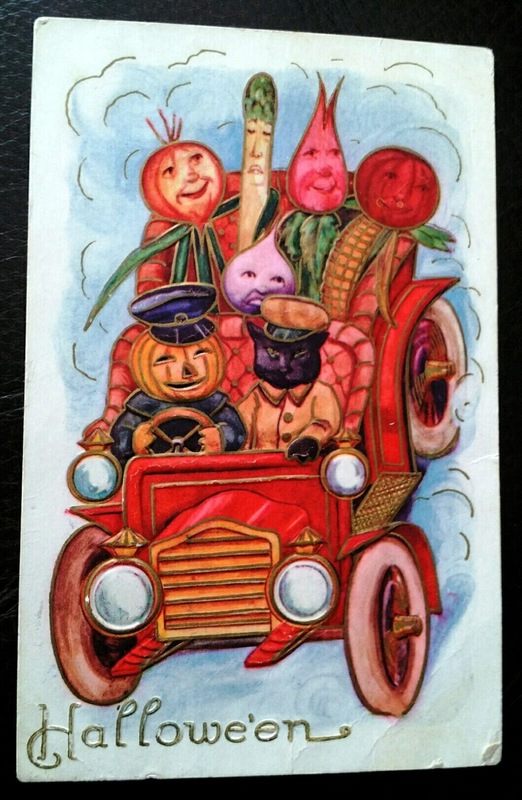 A few years ago, I received another Wolverine tin shop, the General Grocery, which also dates from the 1930s - 40s. 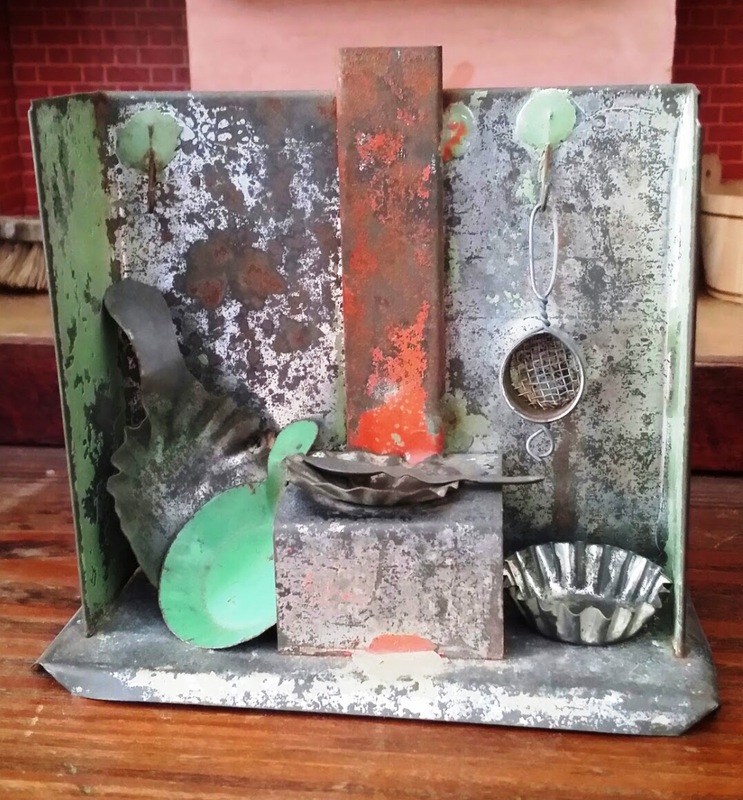 This one is smaller, measuring 20 inches wide by 12 inches tall. 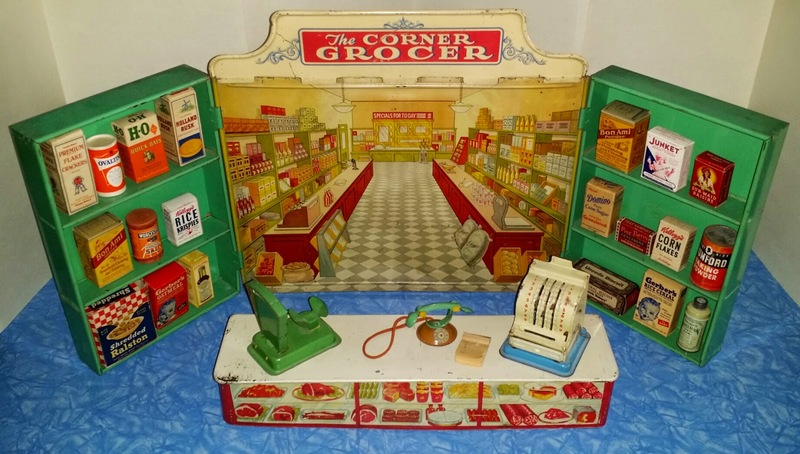 It is structured differently from the Corner Grocer, with its shelves in the center panel. The side wings still fold in for storage, but they feature beautifully lithographed images of children shopping. 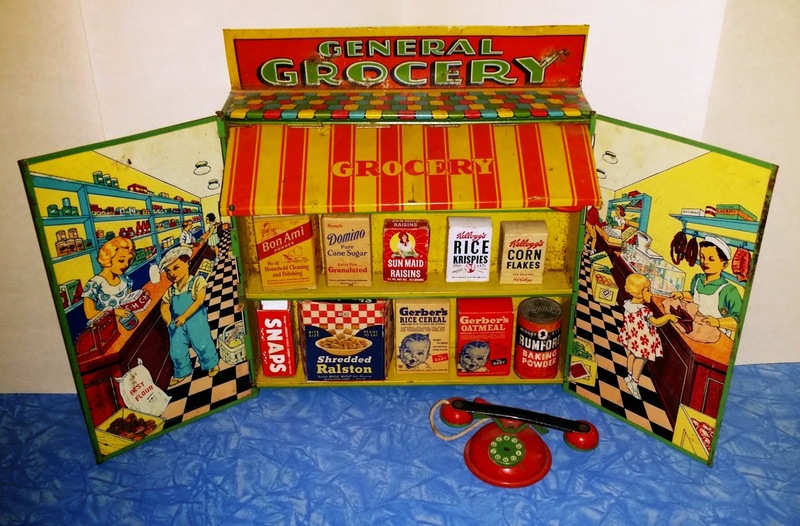 Although this set is missing its counter, it still has its original shop phone, along with a feature unique to this particular grocery, a fold out awning. These shelves are better stocked than my own cupboards....I'd better stop blogging and head off to the real grocery store! 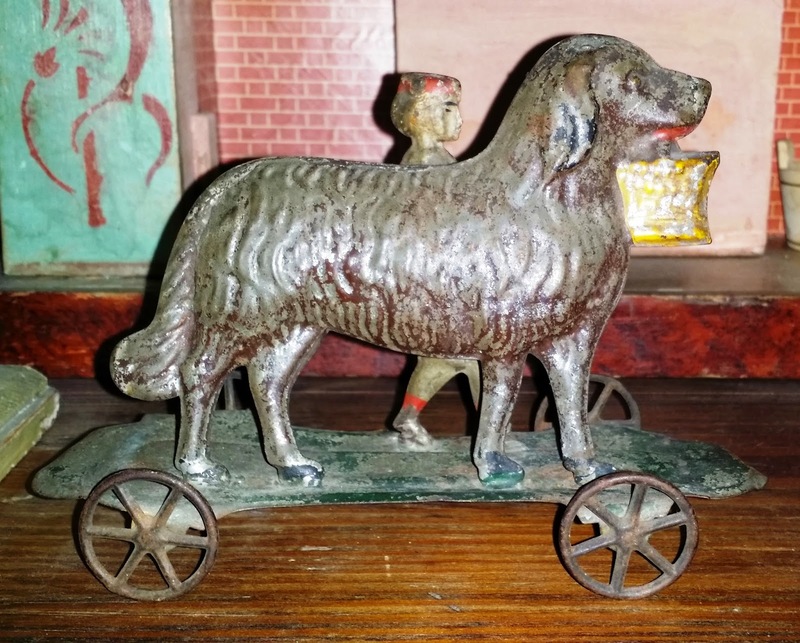 The latter half of the nineteenth century was positively awash with these little tin pull toys, made by companies like Althof, Bergmann of New York, George Brown of Connecticut, and James Fallows of Philadelphia. 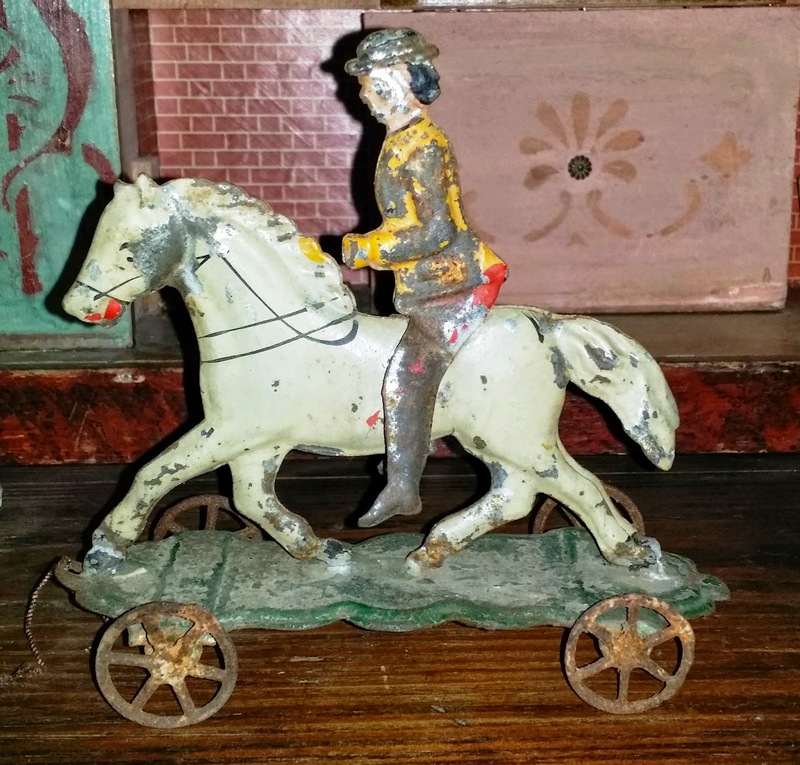 The painted, pressed tin toys came in an incredible variety of designs and sizes, and they have a folk art quality that is very appealing. 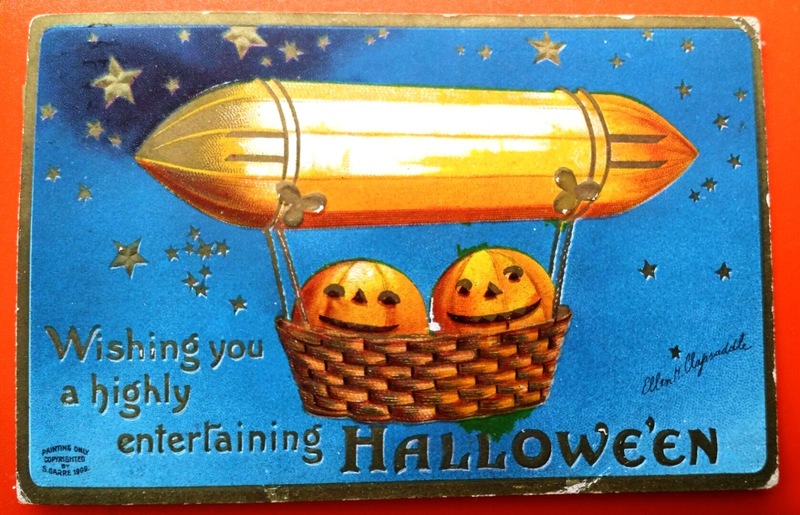 Their fragility, combined with their function as pull toys, makes them scarce today. I was very fortunate to receive two this Christmas. Each measures about 5 1/2 inches long. 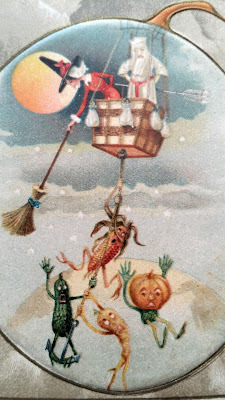 This stalwart looking dog carrying a basket is accompanied by a young child with a stick. 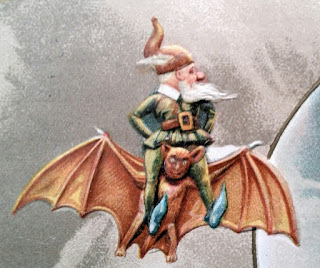 One of the more common themes in these pull toys is the horse and rider, as seen in this example. 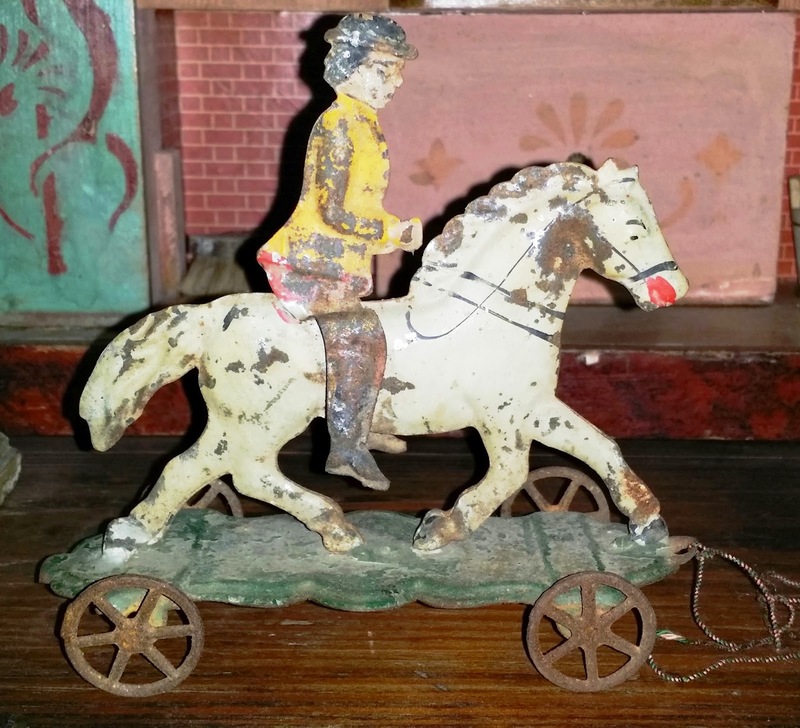 If you'd like to see more of these wonderful toys, a quick Google image search for "early American tin toys" will bring up loads. One of the finest books I know on the subject is "American Antique Toys," by Bernard Barenholtz and Inez McClintock. Mr. Barenholtz was a founder of the educational toy company, Constructive Playthings, and one of the most prominent of early American toy collectors. 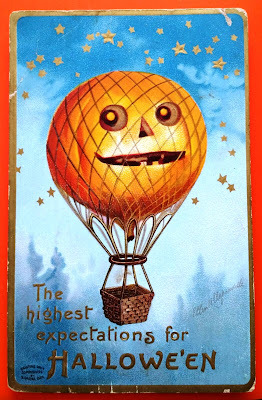 It's a gorgeous book, filled with personal stories of his toy collecting adventures. 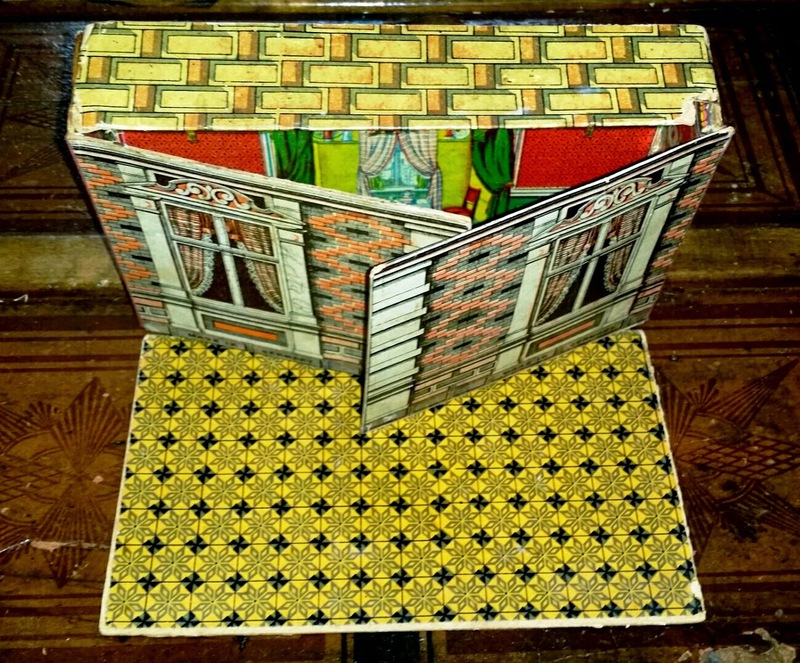 My favorite Christmas present this year was a German folding dollhouse room box, circa the late 1880s - 1890s. 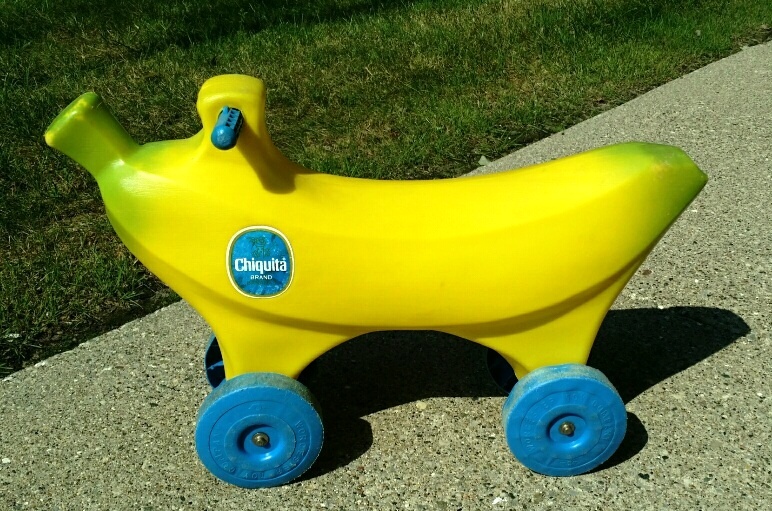 It was clearly a favorite of its original owner as well, as she carefully treasured the fragile toy over many years. 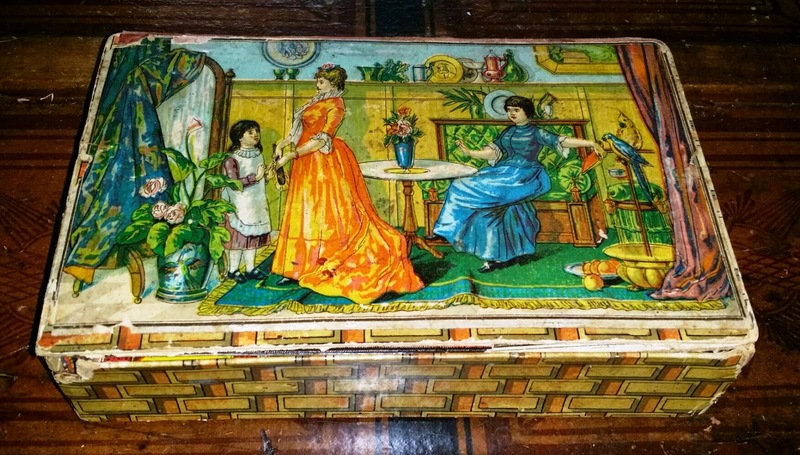 When you lift the lid, the box falls open as the sides drop away, revealing within a gorgeously illustrated Victorian room. 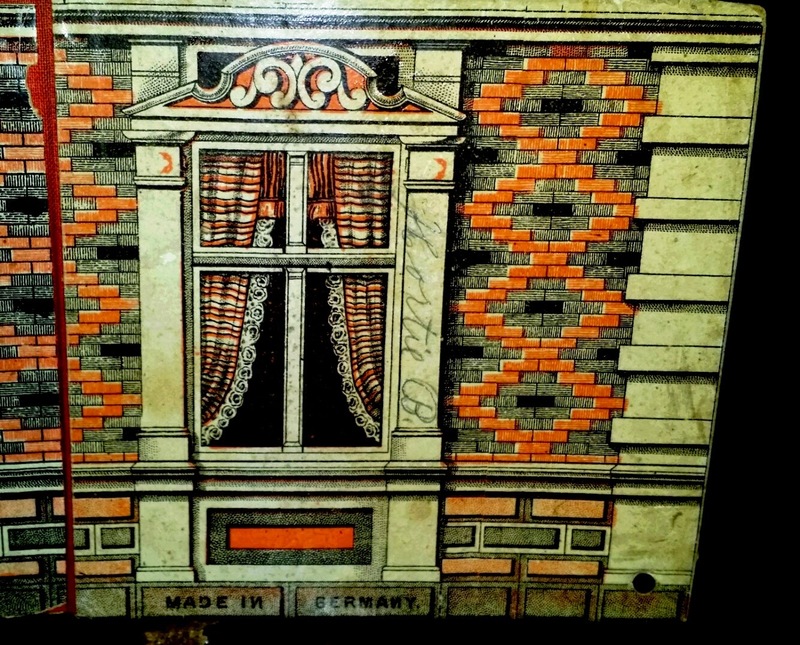 What had appeared to be just a pattern on the outside of the box reveals itself to be brickwork, and the two side panels that fold out are illustrated with windows. The original owner pencilled her name alongside this window. 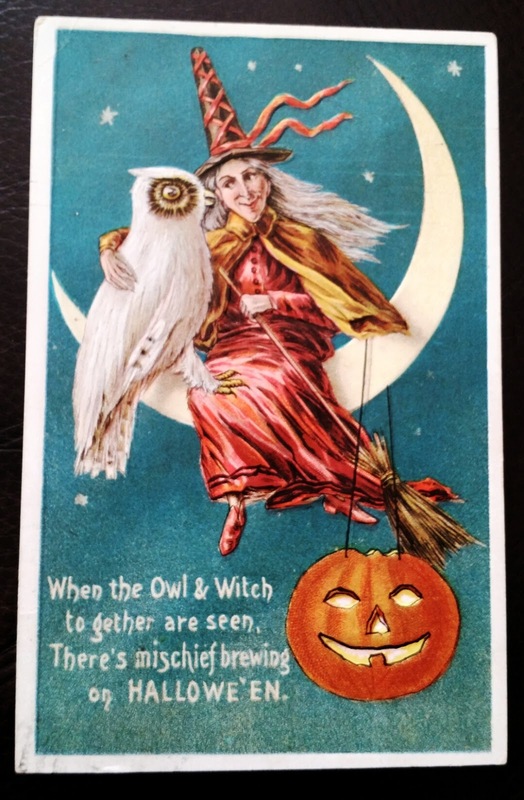 It appears to read "Hortie B." 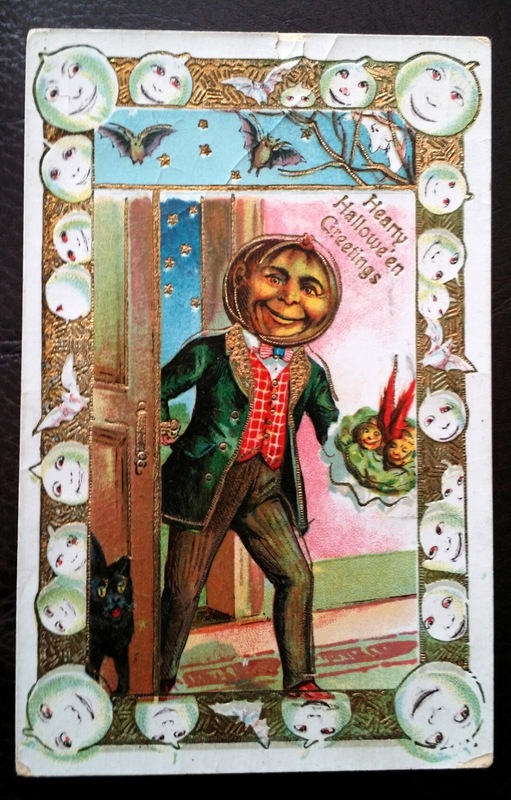 Perhaps short for Hortense? "Made in Germany" is visible below. 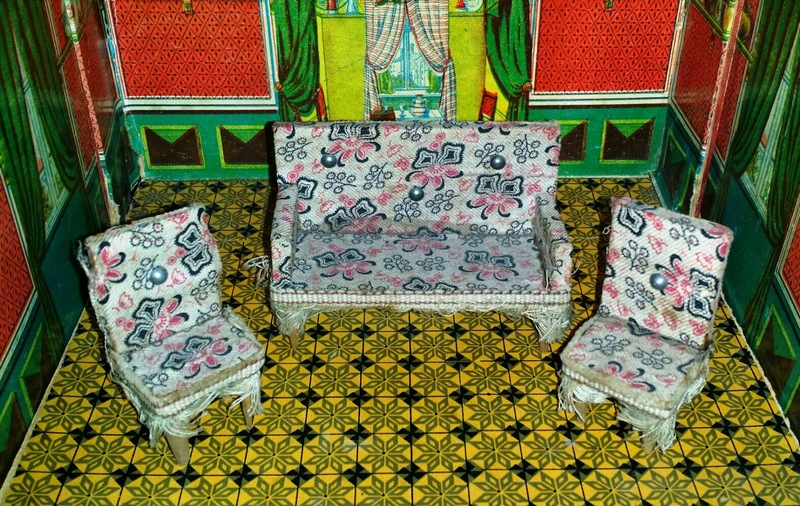 Inside, the lithographed walls are rich with detail and color. 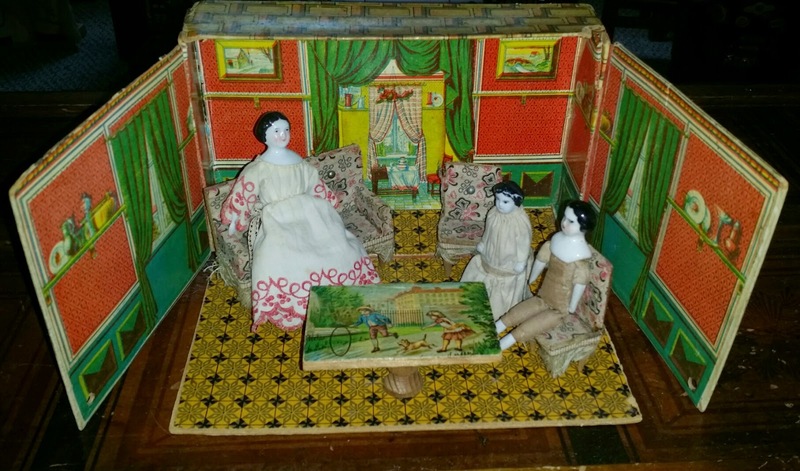 The little room box also contained what appears to be its original furniture, in a small scale and narrow depth made necessary by the shallowness of the closed box. 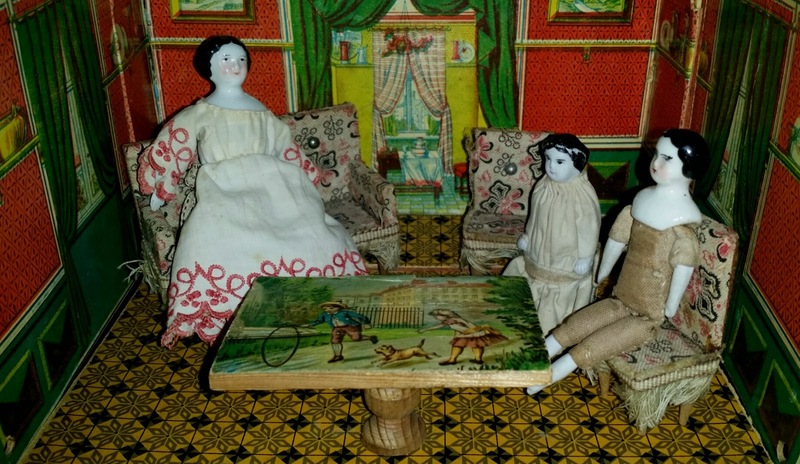 There is an upholstered sofa and two chairs, along with a table that features its own lithographed scene on top. 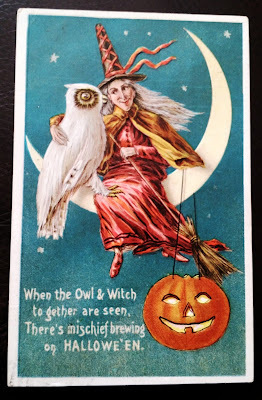 The outside of the box still retains its original store label and price (25 cents, no small amount back in the late 1800s!) 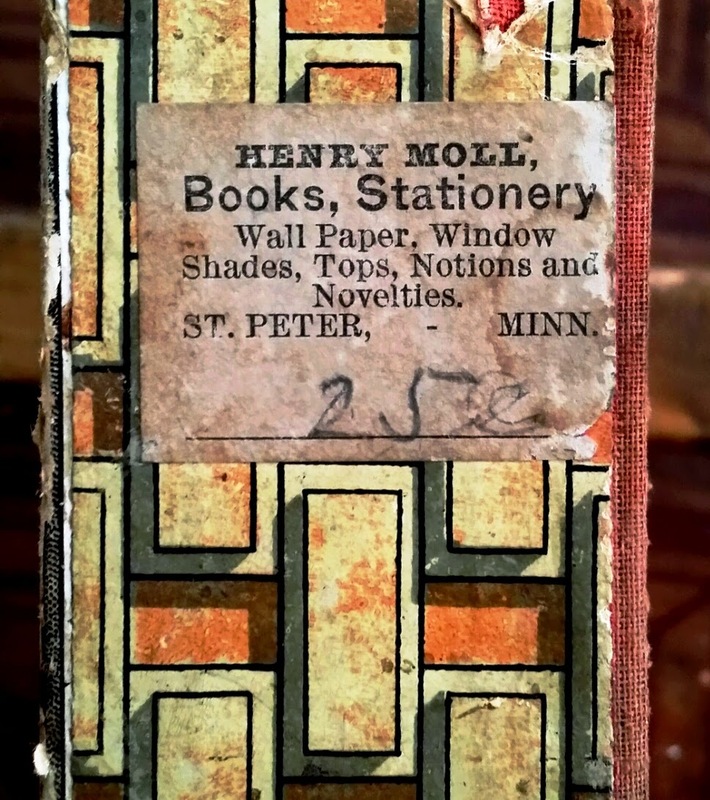 It was sold by Henry Moll in St. Peter, Minnesota, whose shop, interestingly, specialized not in toys, but in books, stationery, wall paper, and window dressings. 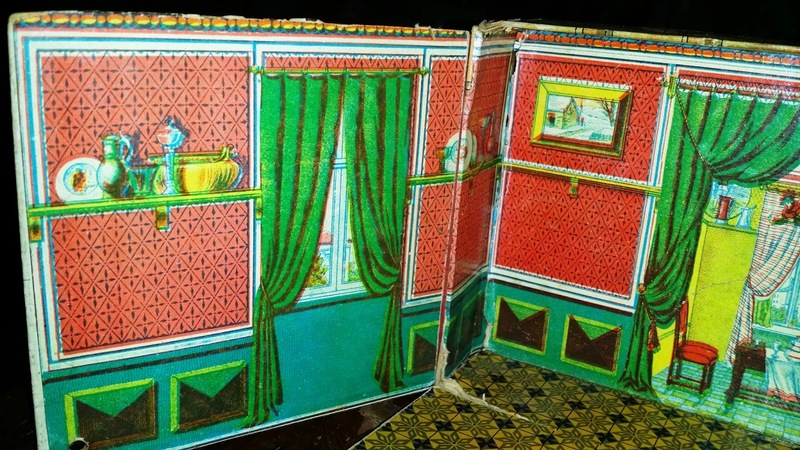 You can imagine a Victorian mother carefully examining wall paper samples at Mr. Moll's shop while her daughter was kept occupied with this little dollhouse. I don't know which tiny dolls Hortie kept in her room box as they were sadly missing, but I found a few in my collection that seemed perfectly at home.